In March 2016, we held the first 48h Maker to Entrepreneur Boot Camp, and we are very happy to share this article by Jenny and Tom, two 8th grade participants from the Canadian International School. 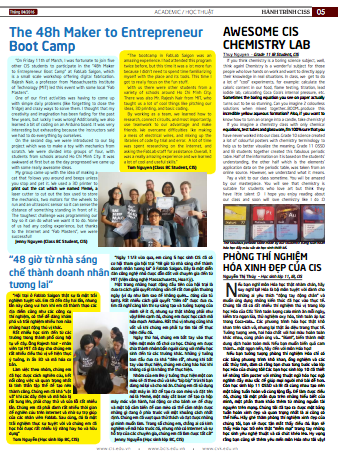 The article was published in the April issue of their School’s monthly magazine in both English and Vietnamese. This entry was posted in Education, Events and tagged bootcamp. Bookmark the permalink. ← Mobile Fablab – Where should we go?